I spent my weekend trying to come up with ideas for the 10lbs of mascarpone that is sitting in my fridge. For some reason I cannot resist impulse buying large tubs of the stuff. You know how they say, never grocery shop while hungry? Well that is even more true when you blog about food, you can justify just about any purchase in the moment. So yea, I need to find a way to deal with all this cheese. Tiramisu was an obvious choice but I make it from scratch (which is a ridiculous amount of work) and then I would unceremoniously eat the whole thing. I really don't want Mr. Humble to come home and find me laying on the floor groaning and coated with coffee soaked crumbs, so I needed to come up with other ideas. I could do more macarons and fill them with flavored mascarpone but I get the feeling that after the macaronathon that was last week on this blog, I would be pushing my luck. I briefly toyed with the idea of a mascarpone cheesecake, as that would use a great deal of the surplus cheese. However, I really don't adore the texture of mascarpone cheesecakes. Still, cheesecake was sounding good and I did have a lot of cream cheese that needed a purpose as well (don't ask how much). So I decided that I could work mascarpone into a cheesecake in the form of a topping. 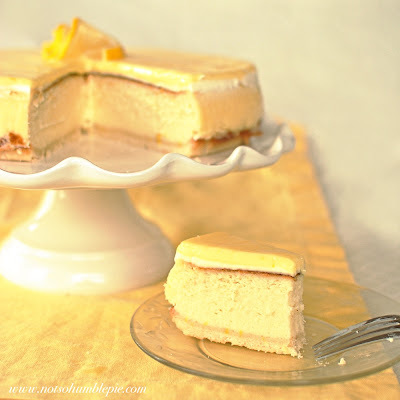 Mascarpone is after all, wonderful mixed with fruit and of course, my favorite, lemon curd! Yes, another lemon dessert! Expect many more. I like them. The 'Not So Humble Pie' is after all, a lemon meringue pie. So the cheesecake I dreamed up yesterday, involves satisfyingly thick shortbread crust, creamy vanilla cheesecake topped with a thin layer of mascarpone then another layer of lemon mascarpone cream. This morning's little slice of sunshine. If you want to kick the lemon 'up a notch' feel free to add a little lemon zest to both the shortbread and the cheesecake batter. Line a 10" springform pan with a circle of parchment paper and set aside. In a food processor, combine the starch, flour, sugar, salt and butter and pulse until the mixture resembles a coarse meal. Pulse in the zest, if using and then pour into you prepared pan. Press the crumbs into an even layer at the bottom of the pan to form the crust. Place in the freezer and then preheat your oven to 350°F with a rack in the lower third of the oven. When the oven is hot pull the crust out of the freezer and bake for 15 minutes. Allow to cool on a wire rack. Preheat your oven to 350°F with a rack set in the lower third of your oven. In your stand mixer using the paddle attachment, beat the cream cheese for roughly 4 minutes on medium speed until smooth. Slowly pour the sugar into the cream cheese scraping down the sides of the bowl well. Add the vanilla and sour cream. Sift the flour into the mixture. Reduce your mixer's speed to low and add the eggs one at a time, mixing until each one is just incorporated taking care not to over beat the mixture. Pour the mixture into the pan with the crust. Set the pan on two large sheets of aluminum foil and smooth them up the sides of the pan, making it water tight. Set the cake into a deep roasting pan and place in the oven. Carefully pour boiling water into the roasting pan. About an inch of water works fine, but don't pour above the lowest edge of your foil. Bake for approximately 60-70 minutes until cake is set but center is still slightly wobbly. Turn off the heat and allow to cool in the oven with the door ajar for roughly 20 minutes. Carefully remove the roasting pan from the oven and set the cheesecake onto a wire rack to cool. Once the cake is room temperature chill for at least 4 hours, ideally overnight. Mix together until smooth and free of any lumps and then pour onto the cheesecake. Smooth the surface with an offset spatula and it is ready to serve. This is exactly like my lemon-marscapone cheesecake recipe. Except the mascarpone cream gets homemade whipped heavy cream mixed in...otherwise, this is it. *sigh* Now, I really want that cheesecake. And I just started a new round of my 'lets be healthy and deny yourself everything delicious for a while' system detox. It only lasts three days. I can hold out that long. Maybe. mmmm yum. this sounds amazing. i have a lemon obsession, too, so keep 'em coming! YUM......... I cant wait to try it. I love mascarpone and lemon curd. Folding in whip cream?! Woah, that sounds even better! This looks divine...just what I wanted to see Monday morning :) Thanks! This brings up a question Miss Chef and I were discussing the other day: what is the difference between New York-style cheesecake and Philadelphia style? They both have rabid defenders, and my impression is that NY tends to be denser and smoother, and Philly is more fluffy and crumbly. Do you know what makes the difference, and--more importantly--which is your preference? again, I am amazed at how delicious this looks. Oh boy, they're both good. The cheesecakes I like to bake are an offshoot of the NY style, one that uses sour cream or crème fraiche instead of heavy cream. Mmm...what a gorgeous, sunny slice of spring! That first photo is so pretty. Makes me want a big slice of that lemon mascarpone cheesecake and forget about how dreary and rainy it is today! The weather in the Northwest has been so unbelievably good, given the time of year. Today is yet another nice sunny day, the spring bulbs are coming up and the cherry blossoms are in bloom. It is a bit hard to remember that it is still winter. Why must you continue to torture me with these luscious lemony confections???!!! It's too much, I tell you - too much! ms. h, do you ever use chips...ie: chocolate or butterscotch chips in your crusts? Wow, that is one great cake and the photos are really amazing... I felt I knew that cake personally! Can't say that I have. Though it does sound good. How many pounds of marscapone now remain in your fridge? I have a current fixation on things turkish-delight or rosewater flavour and wanted to make a cheesecake of the same, however, without "chunks" of turkish delight like I've seen in many recipes. So I have discussed with a better-cake-baker-than-me friend and we've come up with a recipe... but I'm yet to try it! While I'm here, are you able to tell me the difference between granulated sugar and confectioners sugar that you use in your macarons? In Australia we have normal old "white" sugar, "caster" sugar (which I think it just a finer grain), and "icing" sugar, which obviously is the really fine powdery stuff. What is what? I have at least 7 pounds of mascarpone left in fridge, enough to make several of anything. A rosewater flavored cheesecake? Sounds very interesting. I admit to being on a bit of a flower water kick myself. Icing sugar/confectioners sugar/powdered sugar are all the same thing. Looks amazing. Once AGAIN my mouth is watering from one of your posts. Why is it that you aren't a professional pastry chef? Because I look awful in a toque. Still love lemon more than you. mmmm... little slice of sunshine (+10000). What a great idea. But what bugs me is this: a 10 lb. tub of mascarpone. I've never seen any soft cheese in a tub that big. Oh no, not a single 10lb tub. I have two tubs totaling 10lbs (5lb each). I buy them at a local restaurant supply along with most of my other baking staples (flour, sugar, eggs, butter, etc). I'm curious, what don't you like about cheesecakes made with mascarpone? I made one a couple of valentine's days ago that was half regular cream cheese/half mascarpone, and while it was a little softer textured than previous cheesecakes I've made, I chalked it up to inadequate chilling. It was still quite tasty, pistachio and dark chocolate cheesecake. It is a texture/flavor thing for me. Mascarpone cheesecakes are lovely, don't get me wrong, but their texture is different and they lack the slight tang of a cream cheese cheesecake. That said, I have enjoyed several very nice mascarpone cheesecakes, so they're not in anyway repulsive. I just prefer cream cheese. Just wanted to say "thank you so much"! I made this for my boyfriend's birthday and he absolutely loved it. I had to skimp a bit on the mascarpone topping since it was so expensive but it came out delicious. Oh yes! Mascarpone and lemon! Heaven indeed! Oh dear.. this cheesecake will be clogging my arteries for years (that and because I'm a compulsive bowl-licker). Seriously, this cheesecake is the best I've ever tried, and the recipe actually worked - unlike some I have tried! I had a lovely cheesecake at a restaurant and they said that it was made with half cream cheese and half Mascarpone. I want to recreate it but don't know what quantities to use and what other ingredients would go in it. Anyone have a recipe for half and half?